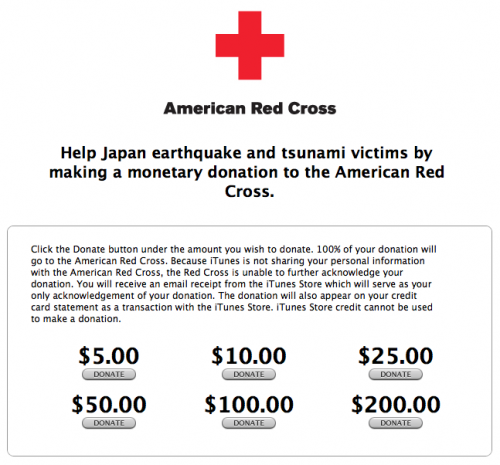 Apple is taking donations in order to help Japan earthquake and tsunami victims. 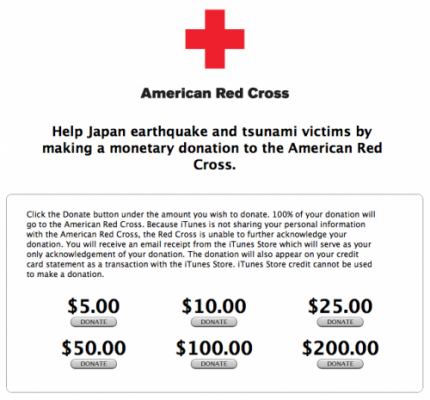 The company created an option in the iTunes Store that allows everybody to make donation to the American Red Cross for the Japanese victims. To make donation, visit this page and choose to donate $5, $10, $25, $50, $100 or $200. Everything happens through the iTunes account you already have. Your gift to the American Red Cross will support our disaster relief efforts to help those affected by the earthquake in Japan and tsunami through the Pacific. Your support will enable the Red Cross to provide shelter, food, emotional support and other assistance to victims of all disasters.